In November 1987, I had been attending New Mexico Tech for two months, in the small town of Socorro75 miles south of Albuquerque. In Socorro, sometimes there is very little excitement going on. As a freshman, I lacked a car and was unable to create excitement at will, and decided to ameliorate the situation by purchasing a television set to take advantage of the free cable TV in the dorms. Jeff Rhoades, my roommate, had a 12-inch black and white set, but I sought something better. But shopping opportunities in Socorro are quite limited. I rummaged through the Albuquerque Journal, and found just what I was looking for. Silo was selling 19-inch color cable-ready TVs with remotes for $199. Unfortunately, the sale price was valid only on Saturday, and the store was 75 miles away. Fortunately, my trusty friend Bob Broilo was interested in going to Albuquerque Saturday to see his girlfriend Liz. Bob's roommate, Dan Selders, even had a car, which he was willing to lend Bob for a TV-purchasing trip. The pieces of the plan were coming together. I withdrew $200 from my bank account, delivered it to Bob Friday night, and everything seemed in place to yield a new television set. On Saturday morning, I was prematurely awakened by my roommate watching professional wrestling at 9:30am. I looked forward to having a television of my own which might provide the potential to retaliate for such abominations, and thus hopefully eliminate them. Saturday dwindled to an end and was replaced with Sunday right on schedule, but I still saw no sign of a TV. At 1:30am, Bob knocked on my door. "I've got your TV! There's just one thing." "Oh, dear. What is it?" "Well, you know those Mr. Yuk poison stickers? Well, this television is. . . well come see for yourself." I did; we retrieved the large box from the car, hefted it up the flight of stairs to my dorm room, and unpacked it. There are greens, and there are greens, the case of this television was definitely the latter. Mr. Yuk would have been very proud. The super-bright green dominated the scene and lent its tint to the entire room. That was of more concern to interior decorators more than myself, however. I wanted to see it work. But when the tube was illuminated, the programming on the tube was the same fluorescent color as the case! Further experimentation proved futile--adjusting every knob available enabled us to vary the intensity slightly, but the picture remained bright green with white and purplish blobs, accompanied by a peculiar cracking sound like a chandelier about to fall from the ceiling. Something needed to be done. Silo was open Sunday from 11am to 5pm. I showed Dan the alarming state of my television, and he sympathetically shelved any plans he had for his car to lend it to me and Bob. Bob and I met Sunday afternoon at 1pm. With the sun high in the New Mexican sky, and 75 miles to drive, obtaining an operational TV seemed an easy prospect. Just as it had Friday night when I had given Bob my money. We bought gas at Socorro's BAR-F gas station and headed North on Interstate 25 toward Albuquerque. Driving Dan's car, however, was easier said than done; it possessed several traits which raised the level of difficulty. The speedometer on the car had a touch of the shakes--above 15 miles per hour, the needle bobbed back and forth over a range of about 10 mph. And as I accelerated, other problems drew my attention from the speedometer. The steering was extremely imprecise.. At speeds above 45 miles per hour, spaced at approximately 10 mph intervals were these spots at which handling is tolerable. Inconveniently situated between these spots are speeds at which steering the car is like navigating a kayak in 10-foot waves. Confining the car's travel to one highway lane was like playing a video game. The car further taunted the adventurous pilot by the transmission indicator perpetually claiming the car was in "Park". Twenty minutes of this road surfing brought us out of Socorro county, but we were still far from Albuquerque. Suddenly, the "Engine Hot" light on the dashboard was illuminated. I pointed this out to Bob. He suggested slowing down--I relaxed on the accelerator to bring us to 75 mph, a mere 10 above the legal limit. We also turned the heat on full blast to help cool the engine by spewing hot air at us. Our mitigation effort didn't affect the light, though. Since the car had no temperature gauge to measure the overheating, we pulled over to investigate. On the shoulder, we opened the hood and smoke poured out. Fortunately, Bob had experience with tending to automobiles, and to this automobile in particular, and dismissed the smoke as the blown gasket that had afflicted the car for several months. We needed to find a more subtle sign of distress. Close examination revealed a steady jet of steam shooting out of the back of the engine. Smelly steam--a sniff test revealed to be antifreeze. We discovered that the engine coolant was remarkably low. Fortunately, Bob had brought along a gallon of water (it is the desert, after all) which we poured into the auxiliary coolant tank. We waited a half-hour for the engine to cool down, and started out again. This time, I took it easy at 70 miles per hour. All seemed well for five minutes, but then the thermal warning light came back on. We stopped along the side of the road, and reconvened the research committee. This time, we identified another problem--there was a severe shortage of oil. We found a quart in the trunk which we poured into the engine. Then we poured the rest of our water into the again-depleted coolant reservoir, which spewed forth more steam. We loitered to give the car a chance to cool, and resumed our northward journey. Our progress was negligible--not two miles before the dreaded light came on again. The research committee found that the latest malady required more close examination. Fortunately, for progress, we had little to distract us. Bob discovered that a valve had completely rusted through, and that a significant portion of the coolant flowed out through an opening not part of the valve's design. We had identified the coolant problem, but no solution was at hand. By this time, we had made enough progress to bring us toward an outpost of civilization. We started the car and limped northward, exiting at Los Lunas, still 35 miles from Albuquerque. We stopped at Exxon, where the lone attendant directed to an auto parts store that we soon discovered was closed Sundays. We returned for his next suggestion, another gas station that was not only closed, but also had a sign outside reading "Floyd's Barber Shop". We reckoned that we had exhausted the attendant's supply of suggestions, so we headed further into town, where we found a FINA gas station with a mechanic on duty. "Hey--would you happen to have a section of pipe we could use to bridge this here gap and connect these hoses?" The three of us saw a wide variety of miscellaneous parts, but nothing suitable. "Maybe there's something on the pickup truck around back." Around back at the FINA was a miniature junkyard. The pickup truck to which he referred had been run through a mobile home, and most of the front windshield was on the seat inside. The engine had been extracted, leaving a large cavity under the hood. But there were a few orphaned parts clinging to the side of the empty chasm. One of those parts was a perfect match for the leaky valve Bob held. We felt fortunate beyond belief, and the FINA mechanic was so amazed at our good fortune he gave us the part for free. We bought a gallon of anti-freeze, filled up our water jug, and set off again, ecstatic to be under way again. Neither Bob nor I had a watch, so we turned on the AM radio, and soon discovered that the time was 4:51pm. We 9 minutes until Silo would close, and 30 miles to travel. Faced with the horrific prospect of scrapping this entire ordeal and trying again some other day at a third trip to Albuquerque, a speeding ticket no longer seemed a significant concern. We went as fast as the Pacer would go--and, kindly, it did not overheat during the rest of the trip. By the time we had entered the Albuquerque city limits, turned right on Interstate 40, took this exit, this left, that right, and found the Silo. It was 5:25, twenty-five minutes after the were supposed to have closed. We found an open door, entered, and found a salesman who listened to our sob story ("Oh, you got the green model! "), and agreed to replace the TV with a functional duplicate, which he consented to allow us to test in the showroom. Its tube showed vivid hues of every color (although the case of this TV was every bit as green as the first one). We loaded the TV into the car, drove to McDonalds where I treated Bob to dinner, and then returned to Socorro. The TV worked served me well during my remaining five years in New Mexico, and another nine years on loan to my friend Josh. 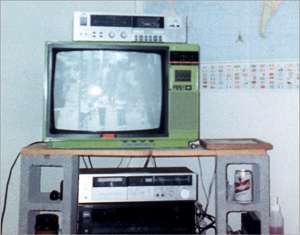 In 2003, however, obsolescence caught up with it, and the Green TV was retired, after fifteen years of brightening the lives of those who encountered it.